Happy Socks started in 2008 by two Swedish pals who had a vision: to spread happiness by turning an everyday essential item into a colourful piece. Happy Socks upholds quality, craftsmanship, and creativity to make their concepts come to life. Today, Happy Socks are sold in over 70 countries across every continent. They feature a wide variety of models and designs with a large spectrum of colour combinations and original patterns. 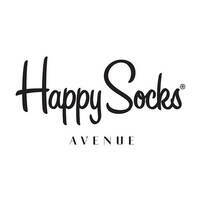 Their goal is simple: to spread joy and happiness around the world in one Happy Socks store.